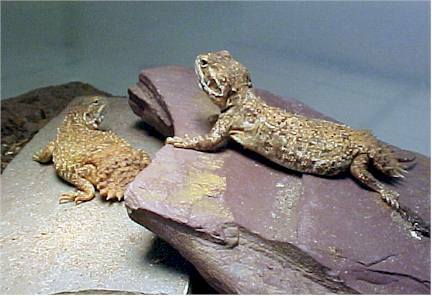 The Dwarf Shield Tailed Agama (Xenagama taylori) is a small agamid originating from arid regions of Northeastern Africa. The tail resembles a miniature "shield", hence the common name, Shield Tailed Agama. They are very hardy lizards which adapt well to captivity. One unique characteristic we have discovered is that they will dig a shallow tunnel and block the entrance with their tail at night in hopes of deterring any would be predators. The Xenagama taylori is a very personable lizard with many interesting habits and characteristics, many of which resemble the very popular bearded dragon (pogona vitticeps), which makes them an excellent choice as a new breeding project or a pet lizard. 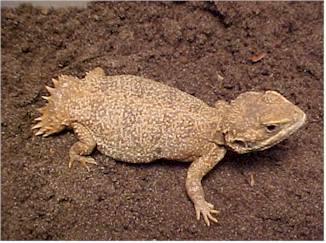 Xenagama taylori grow to an adult size of 3" to 3 1/2" in length and weigh up to 20 grams. Hatchlings range from 5/8" - 1" in length and weigh as little as 3 grams at birth. Coloration varies from a dull sandy brown to a brilliant "brick red" body color with varying amounts of black speckling. Small amounts of partial white spotting is noticeable on young specimens, but seem to fade with age. Adult males display a brilliant neon blue chin coloration when "fired up", usually during breeding behavior, male combat or a heightened state of alertness. Some females will also show varying amounts of blue chin coloration, but is very nominal compared to that of the male. We have tried several housing and substrate combinations and have had varying amounts of success with each. At first sand was considered to be the substrate of choice, due to the belief that this most resembled their natural environment, but was quickly discarded because of the lack its tunneling ability. Our next choice was a combination of cypress mulch and sand, where sand was placed on one end of the enclosure and mulch on the other. The lizards did not seem to prefer either end over the other, but we did notice they spent the night time hours buried under the cypress mulch. The problem with this type of set-up was their food items would bury themselves in the mulch and go unnoticed, and after several days and feedings the enclosure would have hundreds of crickets or mealworms running around stressing the lizards. We have found that garden soil dug from outside works the best. It has great compacting abilities, which allows for tunneling, is easily cleaned or replaced, and does not offer the food items a place to hide and go uneaten. Substrate should be between 3" to 5" deep as Xenagama taylori are great diggers, they are often seen digging multiple tunnels under and around the rock slabs and/or driftwood pieces supplied for basking. Their basking area usually consist of a large piece of driftwood and/or slabs of rock or brick. Temperatures at the basking site range from 90 - 110 degrees Fahrenheit which is supplied by an overhead lamp with a reflective shield. We use a 75 watt bulb placed 10" - 12" above the highest point of the basking rock. The cool end of the enclosure is approximately 20 degrees cooler, which allows for thermoregulation. Water is offered continuously in a small water dish about 1" deep, and is buried to where the rim of the dish is even with the top of the substrate. The lizards occasionally drink from the water dish, but we noticed they seem to prefer to drink droplets of water which form on the sides of the enclosure and the basking spots as a result of being misted every other day. Rock slabs provided for basking. There are some concerns about the amount of UV-B and UV-A light requirements of shield tail agamas. At this time we offer little or no additional lighting except for an incandescent bulb used for basking. To date, we have not seen any ill effects from the lack of natural sunlight, although a vitamin/mineral supplement with vitamin D-3 is offered in hopes of fulfilling these needs. Long term deprivation of direct sunlight may prove detrimental, so some exposure is suggested, even if it consist of only a few hours per week. 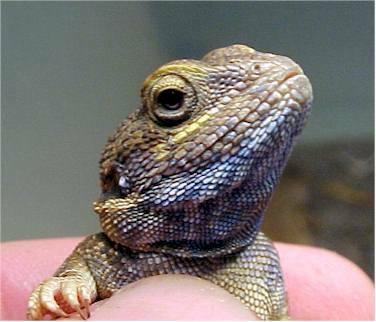 The diet of the shield tail agama very much resembles that of the bearded dragon, consisting of small to medium crickets, mealworms, occasional super worms and a varied "green" leafy salad. Crickets or mealworms are offered daily in amounts which will be eaten over the period of the day. This is generally 3 - 5 food items each. We also dust the crickets/mealworms with a vitamin/mineral supplement such as "Miner-all" or "Reptamin" twice per week. Although, it is not known what importance leafy matter plays in their diet, finely chopped dark greens and vegetables are offered twice a week in small amounts and are misted with fresh water. Greens offered are: Collard greens, mustard greens, romaine lettuce and endive. Vegetables consist of shredded yellow squash, zucchini and carrots. Sub-adult taylori and gravid females seem to relish the greens, but others tend to turn their noses at the offering. Males (on left) can be identified by the enlarged femoral pores and a yellowish waxy substance present around the pores. Female on right has very small femoral pores which are barely noticeable. Sexing of hatchlings and young juvenile shield tails is very difficult if not impossible. Sub-adult and adults can easily be sexed by examining the femoral pores present just above the ventral opening. A males femoral pores are very pronounced and secrete a waxy substance which is dark yellow in coloration. The waxy substance is not present on females, and the femoral pores can barely be seen. Male (left) showing typical blue coloration on chin. Gravid female (right) shows increased girth as eggs develop. 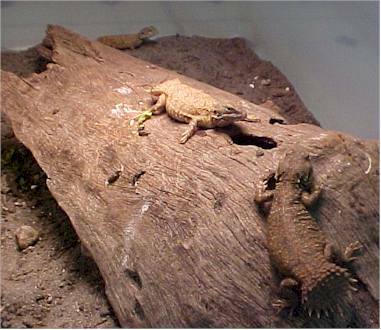 First thought to be a solitary animal, we kept our lizards separate from each other except during breeding trials. The animals were brumated for a period of two months from November 15th to January 15th, where temperatures were kept at night time lows of 65 degrees and daytime highs of 80 degrees Fahrenheit, and a photoperiod of 8 hours. Food was offered once per week in smaller amounts than normal, with water available at all times. At the end of the brumation period, temperatures and daylight hours were slowly increased along with their regular feeding regimen. By February 1st they were back to normal feeding schedules and had a 12 hour daylight cycle. Males were introduced to the single females one at a time, but no breeding activity was noticed. Thinking that they may be a communal breeder, we set up larger enclosures consisting of one male to four or five females. Breeding behavior was noticed almost immediately. The male would "fire up" his chin to the brightest neon blue we have seen yet, and commence to head bobbing erratically and "doing push-ups". The male will chase the females around the enclosure and literally "wrestle" the female while attempting to breed. The first time we witnessed this behavior, we thought we mistakenly placed two males in the same enclosure and they were fighting, but upon closer inspection we discovered they were actually in the act of mating. Males have also been seen copulating with multiple females over the course of a single day. From our experiences, multiple males or male combat is not required to induce breeding behavior. Approximately two weeks after the first successful copulation, the females start to show signs of being gravid. The abdomen increases in size and bulges start to appear from the eggs forming inside. On several occasions, gravid females were pulled from the colony and placed in an egg laying chamber, which consist of approximately 10" - 12" of tightly packed soil, but failed to dig a nest and lay their eggs. So they were placed back in with the colony, thinking that they were not quite ready to lay. We then noticed that the gravid females started digging furiously after being sprayed with water during their every other day mistings. It seems that the females prefer to dig and lay their eggs after a simulated rain, so we started misting the egg laying chambers heavily to induce the females to deposit their eggs. The female will dig a deep tunnel, approximately 8" - 10" deep and deposit 5 to 8 small white eggs. After deposition, she will completely fill the tunnel and compact the dirt with her nose. Once finished there are no signs of any tunnels or eggs being deposited. After the female has deposited her eggs, we remove her from the egg laying enclosure and soak her in a container of water approximately 1/2" deep for 30 minutes so she can get re-hydrated, then place her in an enclosure by herself for a few days to recuperate from egg laying. After a couple days she is reintroduced to the colony. We have females which have already deposited their first clutch of the season become gravid for a second time, confirming the belief that they lay multiple clutches during a single season. The number of clutches per year is still unknown, but we believe they are similar to bearded dragons, and can deposit up to 4 or more clutches per season. 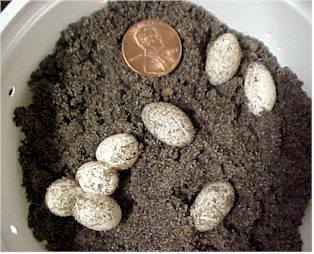 Usually 6 to 8 small eggs are deposited in a 10" to 12" deep nest. Eggs will hatch in 45 to 50 days incubated at 82 to 84 degrees farenheit. The eggs are carefully excavated from the egg laying chamber and placed in a perilite/vermiculite mixture and placed into an incubator calibrated to 82-84 degrees Fahrenheit. The incubator is kept at 100% humidity by keeping a container of water inside the incubator, and periodic misting with a spray bottle. After a 45 to 50 day incubation period the eggs start to darken in color and usually hatch within 48 hours. The young xenagama are left in the incubator for 24 hours to allow the yolksac to be absorbed, and then moved to a small enclosure and kept on a paper towel substrate. 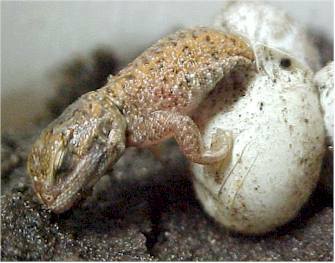 We mist the newly hatched lizards twice a day to keep them hydrated, and offer pinhead crickets after 2 or 3 days of emerging from the egg. Young Xenagama taylori grow fairly rapidly, and will double in size in the first two months. Size of the food items are increased as the young taylori grow, and greens are introduced at about one month of age. We keep the hatchlings and juveniles in communal set-ups identical to that of the adults. With the fast rate of growth, we believe sexual maturity is reached within the first year, but do not actually attempt breeding until well into their second year. Captive born 2001 hatchlings at three months are approximately 1 3/4" long. Although the exact husbandry of keeping Xenagama taylori is not yet completely known, we are well on our way to understanding this unique species. 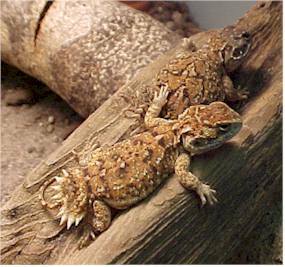 Successful captive breedings will become more common and will help to promote the shield tailed agama as an exciting and interesting lizard kept by hobbyist. We urge hobbyist who have had success keeping this species to share their husbandry techniques, and help promote the species.